B'ham Holocaust Center, AIDS Outreach partner to "Remember Their Voices"
The Birmingham Holocaust Education Center, in partnership with Birmingham Aids Outreach, will host “Remember Their Voices,” a double bill opera performance at the newly-renovated Lyric Theatre on March 5 at 7:30 p.m.
Jake Heggie's “For a Look or a Touch” is a work dealing with the experiences of German homosexuals during the Holocaust. Completed in 2007, the two-character opera is based on the journal of Manfred Lewin, a gay Jew murdered at Auschwitz with his entire family, and the memories of his lover, Gad Beck. Daniel Seigel and Drew Tombrello comprise the cast, directed by Dane Peterson. Lester Seigel will conduct musicians from the Alabama Symphony Orchestra. The second opera will be “I Never Saw Another Butterfly,” based on the poems and drawings of the children of Terezin concentration camp. The performance will feature sopranos Kristin Kenning, Erin Saway Moore and Marissa Blount, and actors Dana Porter and Maria Caycedo. Tickets are $25, $15 for students, and are available here. The BHEC is holding its annual Holocaust Speaker Series at the downtown branch of the Birmingham Public Library, featuring free talks by local and out-of-town speakers. The annual Holocaust in Film series is starting on Feb. 28 at the Emmet O’Neal Library, featuring discussions led by University of Alabama at Birmingham History Professor Andre Millard after each film. The speaker series starts on March 2 at noon with background for the March 5 “Remember Their Voices” performance. 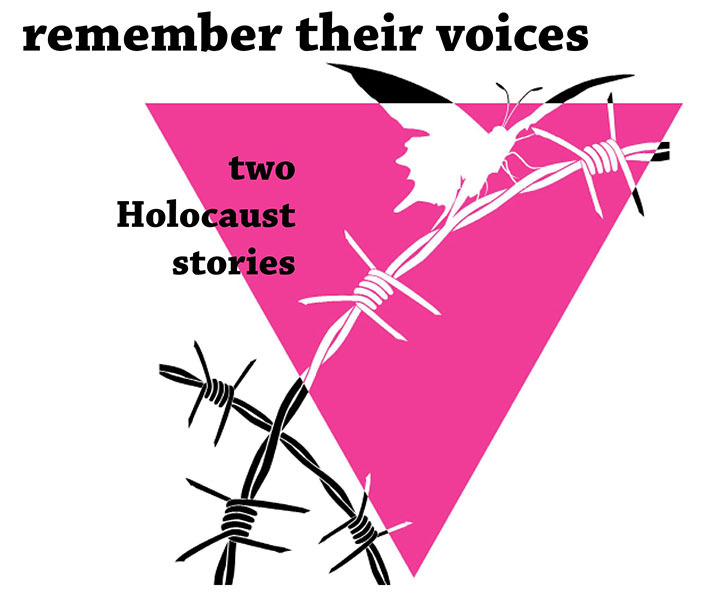 BAO Executive Director Karen Musgrave will give historic background on the Nazi persecution of gay men and the symbolism of the Pink Triangle. Rebecca Dobrinski, BHEC Executive Director, will talk about the Center's Holocaust Studies Library and highlight some recently donated books about the Pink Triangle victims. Daniel Seigel of artsBHM will discuss "For a Look or a Touch." On March 9 at noon, Guardians of Remembrance speaker Denise Lewis will tell the story of her father, Roger Nathan Blum. While visiting a cousin in the U.S., Blum’s parents, sister and cousin were captured by the Nazis and taken to Struthof. After deciding to remain in the U.S., Blum was drafted and sent to fight in France. On March 14 at 6 p.m., James Sedlis will present the story of his father Gabriel Sedlis, a Jewish Partisan during the Holocaust. The series concludes on March 22 at 6 p.m. as Esther Levy and Bari Katz present the story of local resident and Holocaust survivor Dora Nesselroth. The film series at Emmet O’Neal begins with “Karski and the Lords of Humanity,” Feb. 28 at 2 p.m. Combining unique archival footage with animated sequences, Slawomir Grunberg tells the story of Jan Karski, hero of the Polish underground and the first person to reveal to the Western Allied governments the atrocities and mass murders committed by the Nazis in occupied Poland. Karski infiltrated the Warsaw Ghetto and a Nazi transit camp and carried his eye-witness report of the atrocities to Britain and the U.S., hoping that it would shake the conscience of the powerful leaders, or as he would later call them, the Lords of Humanity. On March 3 at 6:30 p.m., “Einsatzgruppen: The Death Brigades” will chronicle the Nazi mobile killing squads, who were dispatched throughout Eastern Europe and murdered over 1.5 million Jews, Roma, Communists, the disabled, partisans and Soviet prisoners of war. Local collaborators assisted the highly-educated officers. “Radical Evil,” on March 13 at 2 p.m., is Oscar-winning director Stefan Ruzowitzky’s exploration of how ordinary people can become mass murderers, concentrating on Nazi soldiers in Eastern Europe who murdered Jewish civilians with pistols and rifles between 1941 and 1943. The film is based on quotations from the perpetrators and features interviews with psychiatrists, historians and genocide experts, as well as Benjamin Ferencz, one of the chief prosecutors at the Nuremberg trials, coming to the conclusion that there was nothing unique about the Nazi killers. The series concludes with “Phoenix,” April 3 at 2 p.m. The film is a haunting portrait of identity, loss, and the search for answers in post-World War II Berlin. A disfigured concentration camp survivor, unrecognizable after facial reconstruction surgery, searches ravaged Berlin for the husband who might have betrayed her to the Nazis. Southern Jewish Life: B'ham Holocaust Center, AIDS Outreach partner to "Remember Their Voices"